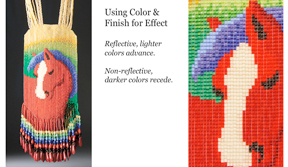 Bead finishes can be tricky and frustrating. Why does one bead appear green in the tube, blue when I place it on the table, and gold when I string it? 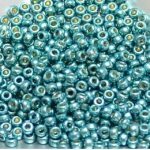 Why does one bead sparkle and the same colored bead in a different finish look flat and recede? Bring up to 3 of your favorite personal pieces, plus 2 that you feel did not measure up to your expectations as far as the texture and finishes are involved. You’ll then be able to work with beads in any way you like to explore finishes and textures. Bring all the beads you can physically haul to class! Or bring just a few… whatever you prefer. Includes interactive instruction & critique, and extensive handouts. Margie Deeb is gracing us with her presence and we’re taking 50% deposits on spots in this awesome all-day workshop. Register to reserve your spot today! Attendees are encouraged to bring examples of their work with them — this is an interactive workshop, and the more pieces you bring, the better the experience will be. So pack up your best (or worst) to bring along. Deposits are non-refundable. Attendees will be expected to pay the remainder the day of the workshop at the latest. Price listed is 50% deposit. Total cost of the workshop, minus tax, is $110. If you would like to pay by check, cash, or in full by credit card, call us at 865.980.0237. No spots left? Call or email us to get on the waiting list. If we get enough interest, we might open up more spots!